With our experienced locksmith company, you will get professional residential services of the highest quality including lock repair, rekey and replacement. Contact us to upgrade your security today. Most of the time, people do not pay much attention to locks, but when such a device starts to malfunction, the situation changes dramatically. You get to spend more time and effort locking and unlocking the doo and you worry whether your home is actually protected. To get a fast and effective solution to the problem, use our residential services designed for all types of locks and keys. It does not matter when the device was made, what its design is or who the manufacturer is. It will be fixed perfectly in as little time as humanly possible. Our mobile locksmith company provides emergency assistance in addition to scheduled services. We will be there for you whenever you need us. It is easy to tell when a lock is not working properly as it simply becomes harder to use. You may have to use a lot of extra force to turn the key or to push the door against the frame in order to operate the device. If you experience any of these or similar difficulties or you can clearly see physical damage to the lock. Count on us to resolve the problem promptly. Our technician will identify the cause through inspection and testing and eliminate it straight away. Only advanced lock repair techniques are used for the performance of the job. When necessary, the service includes lock cleaning and lubrication. In a very short time, you will have a lockset which operates as perfectly as on the day when it was installed. Severe damage and complete lock malfunction are less common. Such issues typically occur due to extremely bad weather, forceful impact or the use of a break-in technique. No matter what the cause of the problem is, the lock has to be replaced immediately for protecting the property. Let us do this job professionally in the shortest time. The device will be replaced with a new, high quality one. 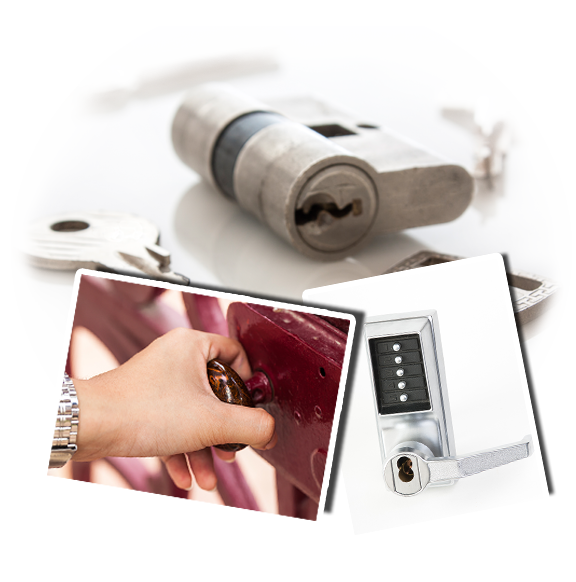 All replacement locks used by us are secure, strong, durable and reliable. The new lock will be fitted accurately for optimal performance. There is no need to wait for a lockset to get completely damaged before you opt for replacement. It is best if these devices are regularly updated for keeping house security optimal. We can do it for you as our service includes full assistance with selecting more advanced locks for the home. You can also hire us to improve the security of an existing door by adding an extra lock. If you already have a traditional spring bolt set, rely on us for deadbolt installation. The job will be done swiftly while the properly will be much more secure. Anyone can lose their keys or leave them at home and get locked out. In such situations, you will receive the fastest help from us. Our lockout service includes not only opening the door with a safe and reliable technique. The cause of the problem will be dealt with right away. When the key has been lost, a rekey will be done and a new set of keys will be provided in order to eliminate the risk of unauthorized entry. Send us an email now or better yet – give us a call!